Cut one 8” square and four 2 3/4” squares. Draw a diagonal line on each small block. 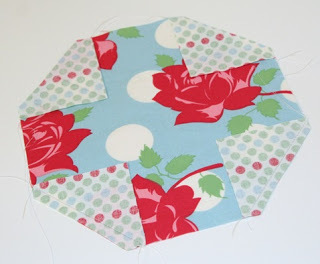 Pin the small blocks to the 8” block, right sides together, and so the diagonal lines run perpendicular to the corners. Sew along your drawn lines. Then cut off your corners leaving 1/4” allowance. Now iron and your done! An 8” snowball block. Thanks for the quick how-to. I'm ready to try this. Cute! You sewing machine users have it so easy. I have to draw all my diagonals. Wow! Much easier than I imagined. I'll have to give it a try! seriously, so flippin easy and cute. you just rocked my world! yet another quilt to add to my list. thanks for all of these! Yeah! I'm definitely going to try this. Thanks for making it look so easy! Awesome – looks much more difficult than it is – love it!! aaw! you're just few hours too late…I already cut 6" squares for a snowball. 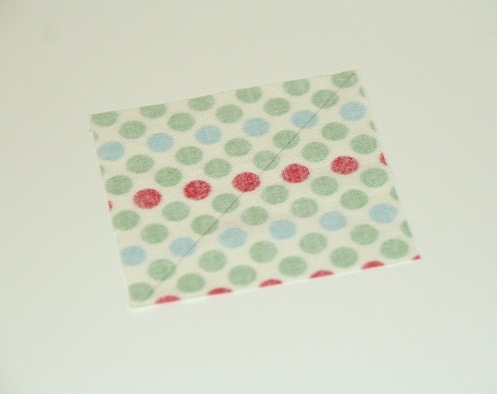 wish I would have waited to hear from you:) I will be cutting 2" squares for the corners. thanks for the tape idea..sounds great! I love this! Thanks for the quick tutorial! Great idea with the tape!! i've been wanting to try a snowball quilt for awhile now. thanks for the tape tip. I know what I'm doing when I get back from a week long get away. that is great. thanks for the easy to follow directions. Thanks for this tutorial on snowballs! You are so generous to help us with the 'how-to's. Looks like you are getting back into the sewing groove! Really cute. What is the fabric line? I love working with half square triangles and was wondering how to avoid drawing all those darn lines! Great idea, thanks! My youngest just married, this would be a nice christmas gift for her and my new son-in-law. Thanks! What a great idea for the painter's tape. Drawing on the lines can be so annoying. Thanks for sharing! What a great idea! I was just wondering what quilt I was going to start next! Thanks for the idea! Do you have a way of figuring out the proportion when you are using differently sized squares? For example a 5 inch big square? Love that tape trick. Such a good idea. (I don't mark my diaganals either). Don't waste those corners! 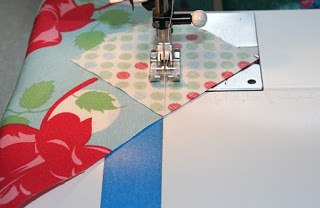 Bonnie Hunter of Quiltville teaches that if you sew a second seam outside the first one and trim between them, you have ready made triangle squares for a future project! 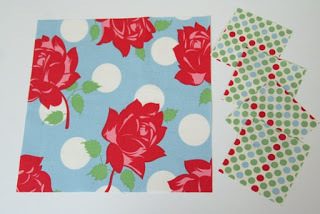 Snowballs are a great way to use up some scraps! Great mini Tutorial! Thanks! Your bird Snowball quilt turned out beautiful – this would be a good quilt 'camp' project! I am making a list of all the beautiful quilts I need to make, I think I will add this to that list. Are you having so much fun being by your family? That just gave me a great idea for using a charm pack and layer cake I have. Do you think the measurements would work out for that? They are 10" squares and 5" squares. I guess the charm square would be too small, so you could use the layer cake and trim down the charm square to a smaller square size. I'm going to try it and see how it works. I really like the idea someone left in comments of making triangles with your scraps too. I don't know how you can stand to sell something this cute!! Oh, and what is the fabric in your snowball example? It's really cute! I really enjoyed looking at all the new blogs and getting that inspiration from all the quilts that were shown. 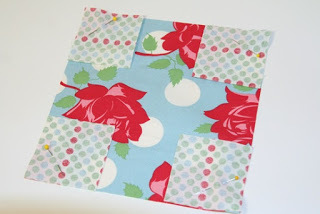 I'm making one of these quilts right now and didn't know that it was called a snowball quilt. That's great. I love this blog. Here, from Brazil I've learned so many cool things and I'm so grateful for this because here I don't find people who do quilts, patchworks, etc and no patterns. Thank you for all shared here. Thanks for this tutorial. I plan to make a hospice charity quilt with it. I taught myself to quilt and wanted to expand my horizons. Thank you for teaching me to do that! My first one to try will be the snowball quilt, yippee! 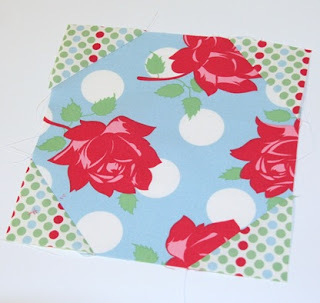 I just made a quilt for my grand son and I am writing about it on my blog. I made it with the snowball pattern/block. Is it okay if I link to this post of yours for a "how to" to make the snowball block?